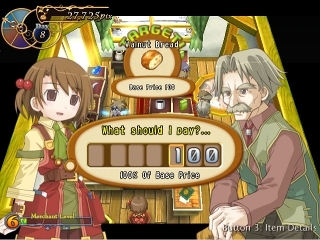 Ever notice how, in your garden-variety RPG, the shopkeep gets to sit behind a counter all day while you quest up and down the countryside slaying monsters and looting dungeons... yet the shopkeep seems to be the one to wind up with all your gold by the end of the game? Ever wanted to switch places for a day? Meet Recettear. This game is all about the business end of the RPG world. You get to manage stock, decide which of your wares to showcase, haggle over prices, and, pay off an outstanding debt. Nope, not even kidding - paying off the debt, in fact, is the main storyline of the game. In a nod to traditional dungeoneering, you do get to hire adventurers to explore... Read All Ever notice how, in your garden-variety RPG, the shopkeep gets to sit behind a counter all day while you quest up and down the countryside slaying monsters and looting dungeons... yet the shopkeep seems to be the one to wind up with all your gold by the end of the game? Ever wanted to switch places for a day? Meet Recettear. This game is all about the business end of the RPG world. You get to manage stock, decide which of your wares to showcase, haggle over prices, and, pay off an outstanding debt. Nope, not even kidding - paying off the debt, in fact, is the main storyline of the game. In a nod to traditional dungeoneering, you do get to hire adventurers to explore procedurally-generated dungeons for you, and you get to control them (while your actual main character tags along behind, invincibly, to do the beancounting), but the big moments of the game happen while you're behind the counter. This is a *very* Japanese game. The translation to English was done just fine, maybe even better than most imports, but the culture was preserved. For example, nobody is "slightly" anything. The game's "broke adventurer" fellow isn't just hard on his luck; he's found in the park trying to suss out which plants are safe to eat. The game's "rich snob" makes a special trip to your shop to explain how she's going on an excursion for the express purpose of eating foie gras. Your character berates herself every time you fail to make a sale; the sound effects and visuals would be right at home in any manga or anime piece you could imagine, and so on and so on and so on. It's a fairly easy game. I won't go into spoilers here, but I will say that there's only so bad that the game will let you be. I've "beaten" the game - yes, I'm sure, because the characters actually broke the fourth wall and thanked me for beating the game on behalf of the studio - but they also point out that there's a lot more content to be enjoyed in the game's "endless" mode. To that end, I don't feel qualified to fully evaluate the story... but I will say that when I beat the game, there were some pretty glaring loose threads that none of the characters even really felt like acknowledging. I'm not sure if that's reserved for a Super Special Secret Plus Plus Plus Hooray ending, or if the characters are just like "whatever" about these points, but I was definitely left waiting for something that never came. All in all, I'd give this one a 7/10. I don't know that I'll ever play it all the way through again, but I feel like I enjoyed my time here. And the next time I fork over 100,000 gold for a Diamond Sword, I'm going to hesitate just that one moment longer. Now I know for *sure* this shopkeep's job isn't as hard as he's making it out to be. This sounds really interesting and I love the concept of the game. Would you recommend it at $20 or wait for a sale? Huh, I really love the concept for this game though. I caught it on sale, myself - I think I paid something like $8 for it. It's hard for me to put values on video games these days, but I'm not convinced it stacks up to other $20 games. There's a demo you can try that might help you gauge the overall value, but I'd probably wait for at least 25% off on that one. Ah a demo cool ill nab that for sure. Thanks Cap!